We have kitty rockstars on Traveling Cats today. Their names are Odie and Bandit, and they're from Indianapolis in Indiana, USA. 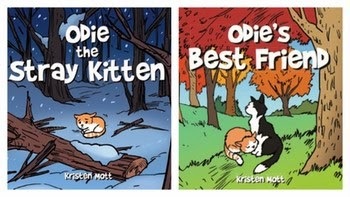 They are the stars of the books Odie The Stray Kitten and Odie's Best Friend by Kristen Mott. 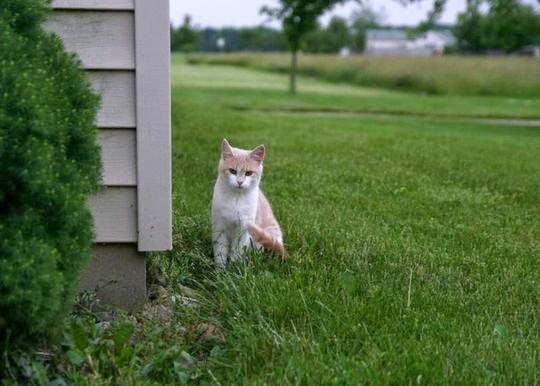 Odie The Stray Kitten is the heartwarming true story of a cat that loses its family on a cold winter night, and finds a new forever home in a barn. Odie's Best Friend is the adoption story of Odie's buddy, Bandit. The two books would make perfect Christmas gifts for children. Sounds like great books. Have a marvellous Monday. These pictures are beautiful and the books sound wonderful! Oh these sound like perfect gifts for my daughter. Love the pictures! That last one is stalking you. What handsome cats! Real stars, for sure. Bet the books are great. They're both very handsome cats. Those are indeed some very handsome cats. I'm sure that as they're from the Indy they're also excellent drivers. You are indeed the blogger with the most unique topic I know so you have my vote. 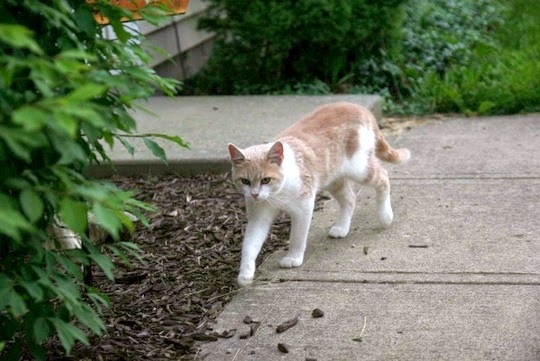 If they're from Indianapolis, they must be extra fast cats! Despite being from Indianapolis, Odie and Bandit are not too speedy and they do not like car rides. They do enjoy their quiet farm life watching over the horses. Thank you for the support of their children's books! We've been and voted for you. Very nice pictures and kitties. The books sound wonderful for Christmas. Odie and Bandit are both so cute! Oh how sweet they are! I did vote. We can see the star quality in both of them! Always fun to meet characters from books! :) The books sound great! I am glad those stories had happy endings! Famous kitties...here in the U.S.A. 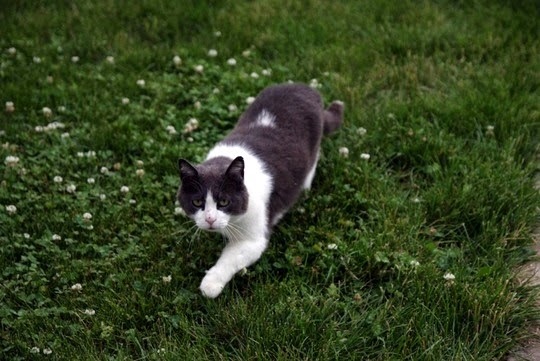 They look very happy wandering around that lush, green grass. What sweet kitties and such a heart-warming story, bet the books are wonderful! Congrats on your finalist nomination, we voted and we love your new header and blog look! Cute cats and the books look cute too!! They are so very cute! Those books sound like wonderful children's books too. They're pretty cats. glad their stories are being told. Yous know weez luv yous fotos. But fings awe gettin' so hawd fur mommy to read to us. Da light pink is almost non existant. At least fur us. Weez sorry to complain, but dat be why we don't comment more offen, we can't hardly find da words fur da box. Those awe sum gweat kitties as usual. We reviewed both books some time ago and love them! Ils ont un air hyper sérieux ces chats.... de vraies vedettes. Vanessa, tu as changé les couleurs de ton blog. Je ne sais pas si c'est mon écran qui fait ça, mais une grande partie des écritures ressort d'un marron très très très pâle. Presque illisible. J'espère qu'ils auront eu droit à une bonne assiette de pâtée ... puisqu'ils sont acteurs si j'ai bien compris ! Well now, I am meeting 2 more darling and famous kitties that have their own book, have you heard of Bisous Bailey the Boat cat? He lives on a boat and has daily stories. Thanks for sharing with The Oh My Heartsie Girls WW this week. I'm a new google+ follower. Here is my post.Have a great weekend. Beautiful kitties! Have a terrific day! I like the kitties and would not mind meeting them and sharing there stories with my son. So I will look for the books the next time I go to the book store as I like reading new Authors and introducing them to my son.